It’s that time of year again. Cloaked figures lurk in the shadows, scouring pavements for black cats and broken mirrors. The superstitious are twitching at the sight of ladders and hoping it won’t rain; lest some sceptic soul provokes fate and opens an umbrella inside. Personally, I find all this friggatriskaidekaphobia a bit unbelievable but I’m not superstitious. As a child, I grew up living next to a graveyard and that never spooked me either. Mind you, the perpetual threat of earthquake in Tokyo had me shaking on more than one occasion! When writing copy; be it on blogs or leaflets, guides or website pages: the golden rule is to make your writing believable. Of course, this rule applies to the other kind of writing I do: writing for pleasure. In such an instance, the focus is on believable characters. Today, however, let’s concentrate on writing believable copy. This is the most important lesson I learned as a teacher. When the technology fails, someone spilt black paint on the lesson plan and you have nothing but a wooden hut as a classroom; you are the only thing left. You make a difference to whether those people are learning. This applies to your writing too. Believable writing speaks from experience. It speaks of things you know. Of course, you need to be careful not to overdo the personal stories. But as with all kinds of writing, the most convincing stuff comes from you and your experiences. Even better is if you show your weaknesses. This just makes you seem more human, and therefore easier to relate to. How many time have you read the following “Many people believe…”? Several times a day, I expect. This innocuous little intro really gets my goat! The reason being that it is totally vague. We don’t know how many people. We don’t know where these people are from or any context whatsoever. It could be (and quite often is) a total fabrication. As a reader, look at how much more effective the opening “People, from Duncan in Aberdeen, to Jennifer in Falmouth, believe…” is. It’s hardly any extra work to have honed the information down and provided some specifics. These people now have names, and locations, which makes them more human. Being specific also applies to using numbers. Quoting 95% as opposed to 94.7% actually makes it seem less believable. Using the more specific figure looks less perfect, which ultimately makes it more credible. Customers relate to proximity. There’s no bona fide reason for this. I guess it kind of makes sense. I mean if Mavis from round the corner says it’s good, it must be good, right? If you’re using testimonials, then source them from various locations, and use place names. From west to east lacks credibility, where from Hay-on-Wye to Tonbridge instantly becomes more convincing. Dorking? Oh yeah, you drive along the A25 and then there’s that roundabout with the giant chicken. I used to spend Christmas near there at my Aunt’s place! Familiarity is believable and it breeds trust. These are absolute gold. Of course, in themselves, testimonials need to follow believability rules. Name the customer; give them a location and present as much information as possible to make them seem more human. Do not edit testimonials. Write them exactly as they are. A tip for generating a credible testimonial is to push customers for measurable results. “Using social media has increased our sign-up by 36%” gives potential customers something to aim for. At about the age of 17, I got a job knocking on doors and selling windows. I had barely any knowledge of the company, was not a homeowner and had never lived in a house with double glazing. I totally sucked. I didn’t care about the product, or the people, and I never got a lead. The best bit, for me, was driving around Cornwall in the van and chatting to colleagues about travel. Sure, since then I have had to write some copy about ideas, products or concepts I am not especially familiar with. But the one thing I have tried to do is put a good angle on it. For example, writing for a reputable insurance company sounds dull. However, writing an article on the geography of your favourite part of Spain, and advising buyers to pay for property insurance suddenly becomes much more interesting. 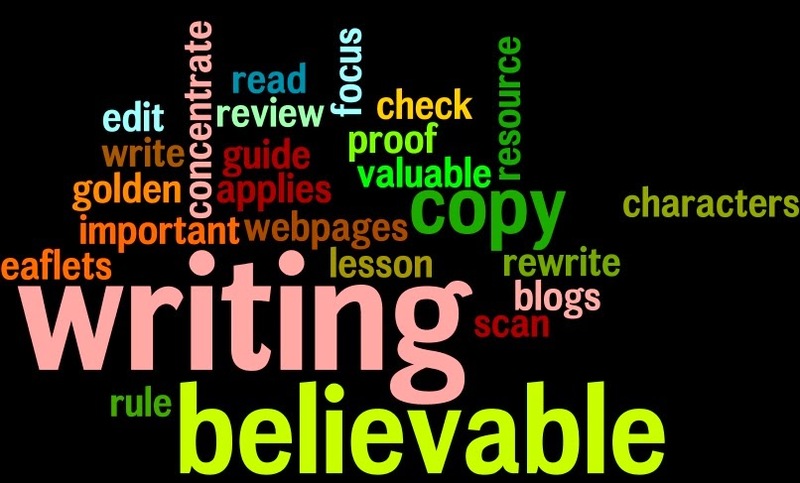 If you believe what you’re writing; it’s likely your readers will too. What are your hard and fast rules for making copy believable? Do you use a guarantee or some other customer benefits? Let us know in the comments section.